Nomad tribe of Jewish origin living in the neighborhood of Tementit, in the oasis of Tuat in the Moroccan Sahara. An account of the Daggatun was first given by R. Mordecai Abi Sarur of Akka (Morocco), who in 1857 journeyed through the Sahara to Timbuctu, and whose account of his travels was published in the "Bulletin de la Société de Géographie" (Dec., 1895; see "Bulletin All. Isr." ii. 42, 1880; "La Grand Encyclopedie," xxiii. 254; Meakin, "Land of the Moors," p.17). According to R. Mordecai, the Daggatun live in tents and resemble the Berber Tuaregs, among whom they live, in language, religion, and general customs. They are fairer in complexion than the generality of African Jews, and are still conscious of their origin. They are subject to the Tuaregs, who do not intermarry with them. R. Mordecai is authority for the statement that their settlement in the Sahara dates from the end of the seventh century, when 'Abd al-Malik ascended the throne and pushed his conquests as far as Morocco. At Tementit he tried to convert the inhabitants to Islam; and as the Jews offered great resistance he exiled them to the desert of Ajaj, as he did also the Tuaregs, who had only partially accepted Islam. Cut off from any connection with their brethren, these Jews in the Sahara gradually lost their Jewish practises and became nominally Mohammedans. These statements of R. Mordecai evidently rest upon some foundation. The Arabs driven to Ajaj are to be identified with the Mechagra mentioned by Erwin de Bary ("Ghat et les Tuareg de l'Ain," p. 181), among whom a few Jews are said still to dwell. 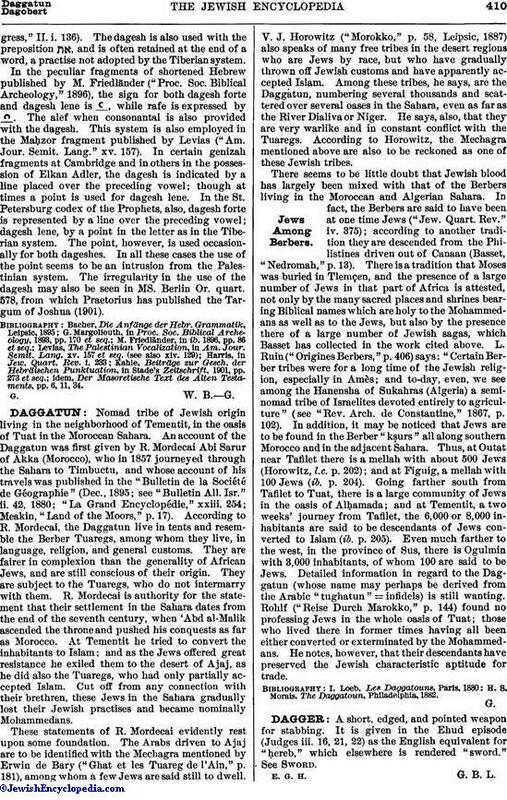 V. J. Horowitz ("Morokko," p. 58, Leipsic 1887) also speaks of many free tribes in the desert regions who are Jews by race, but who have gradually thrown off Jewish customs and have apparently accepted Islam. Among these tribes, he says, are the Daggatun, numbering several thousands and scattered over several oases in the Sahara, even as far as the River Dialiva or Niger. He says, also, that they are very warlike and in constant conflict with the Tuaregs. According to Horowitz, the Mechagra mentioned above are also to be reckoned as one of these Jewish tribes. There seems to be little doubt that Jewish blood has largely been mixed with that of the Berbers living in the Moroccan and Algerian Sahara. In fact, the Berbers are said to have been at one time Jews ("Jew. Quart. Rev." iv. 375); according to another tradition they are descended from the Philistines driven out of Canaan (Basset, "Nedromah,"p. 13). There is a tradition that Moses was buried in Tlemçen, and the presence of a large number of Jews in that part of Africa is attested, not only by the many sacred places and shrines bearing Biblical names which are holy to the Mohammedans as well as to the Jews, but also by the presence there of a large number of Jewish sagas, which Basset has collected in the work cited above. L. Ruin ("Origines Berbers," p. 406) says: "Certain Berber tribes were for a long time of the Jewish religion, especially in Amès; and to-day, even, we see among the Hanensha of Sukahras (Algeria) a seminomad tribe of Israelites devoted entirely to agriculture" (see "Rev. Arch. de Constantine," 1867, p. 102). In addition, it may be noticed that Jews are to be found in the Berber "kṣurs" all along southern Morocco and in the adjacent Sahara. Thus, at Outat near Tafilet there is a mellah with about 500 Jews (Horowitz, l.c. p. 202); and at Figuig, a mellah with 100 Jews (ib. p. 204). Going farther south from Tafilet to Tuat, there is a large community of Jews in the oasis of Alḥamada; and at Tementit, a two weeks' journey from Tafilet, the 6,000 or 8,000 inhabitants are said to be descendants of Jews converted to Islam (ib. p. 205). Even much farther to the west, in the province of Sus, there is Ogulmin with 3,000 inhabitants, of whom 100 are said to be Jews. Detailed information in regard to the Daggatun (whose name may perhaps be derived from the Arabic "tughatun" = infidels) is still wanting. Rohlf ("Reise Durch Marokko," p. 144) found no professing Jews in the whole oasis of Tuat; those who lived there in former times having all been either converted or exterminated by the Mohammedans. He notes, however, that their descendants have preserved the Jewish characteristic aptitude for trade. H. S. Morais, The Daggatoun, Philadelphia, 1882.